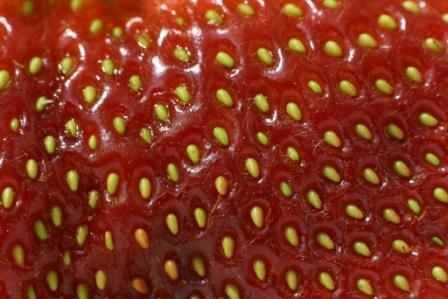 Strawberry is the flavour of the week as we explore The Little Mouse, The Red Ripe Strawberry and the Big Hungry Bear. 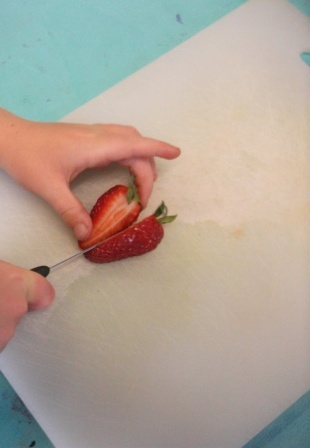 This afternoon we spent some time using all our senses to observe some fresh strawberries, their leaves and seeds. 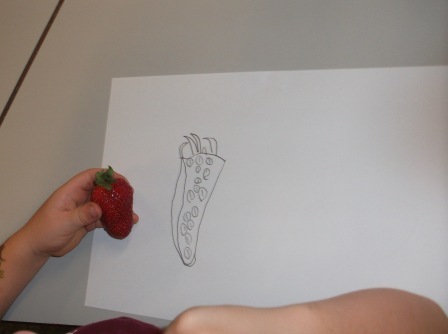 Each child was given a strawberry of their own to observe, feel, smell and draw. 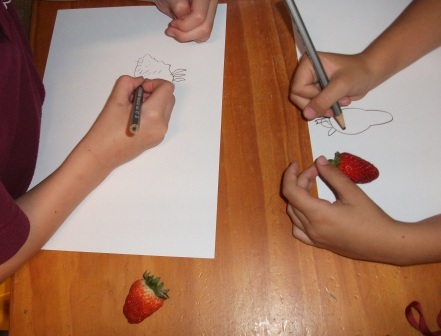 They approached the drawing of their strawberry in their own unique way. 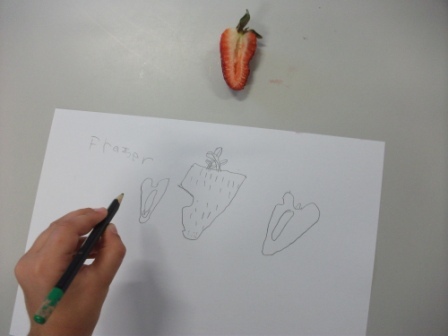 Some children chose to hold the strawberry as they drew, feeling the texture of the seeds and drawing the indents. 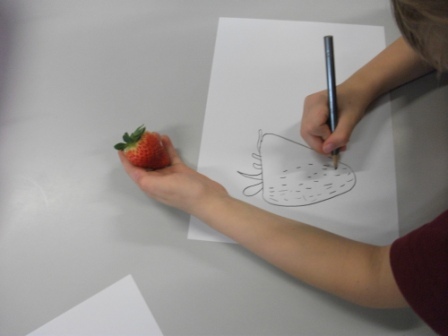 Other children thoughtfully selected which aspect or side they wanted to draw and placed the strawberry accordingly on the table. 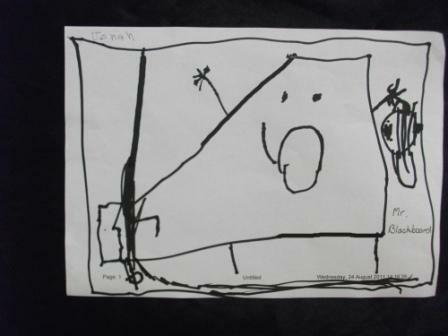 This child noted the bend “like a banana” in his strawberry and decided to draw it from this perspective. 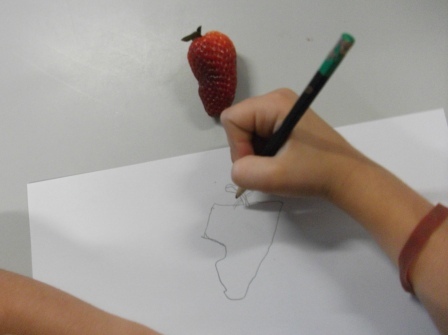 The children’s use of drawing as a language demonstrated the depth of their observational skills far more accurately than if they were to describe their strawberry using words. 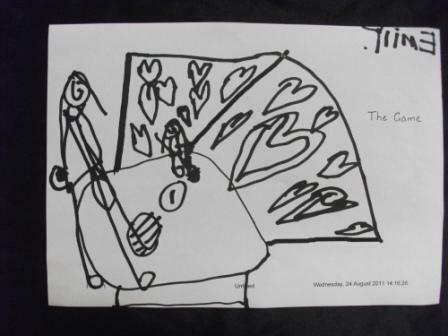 In his drawing J. has really captured the bumps he felt on his strawberry when it was whole and ……. cut. 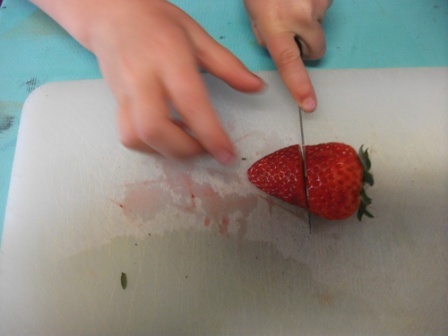 The smell of the strawberries was very inviting and tomorrow we are going to make some strawberry scented playdough. Once they had drawn this view of their strawberry, the children were finally able to explore it with their final sense – taste. 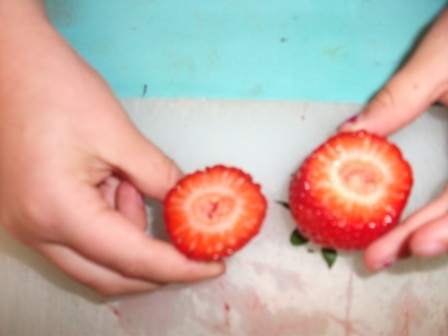 The 2 children who said they didn’t like strawberries prior to drawing them, thought they would like to taste their 2 halves. 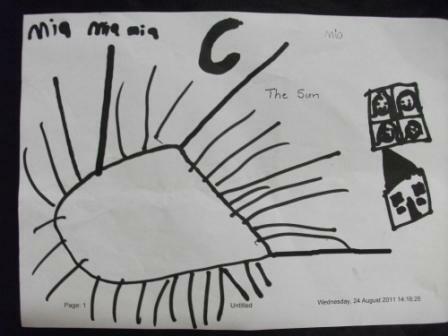 After tasting/eating their berry, the children selected another one to draw. 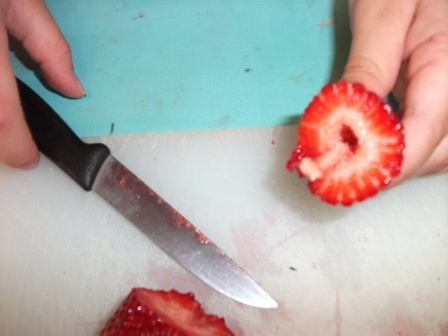 This time we cut the strawberry in half the opposite way. 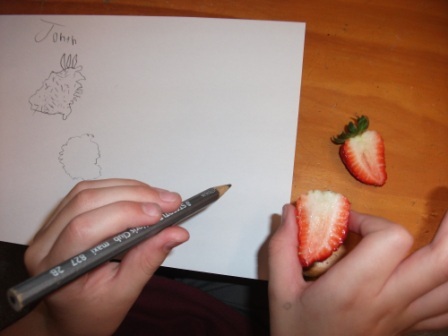 This perspective was interesting to observe and draw as the centre of the strawberry looked like “rings of yumminess”. That were irresistable to everyone. Yum!!!!!! YUM!!!!! I think we had lots of hungry bears today who love red ripe strawberries! Our sound for this week is /v/ and our Did You Know……… Interesting Fact for the week is about vortices. Every Monday morning we discuss our Did You Know……. 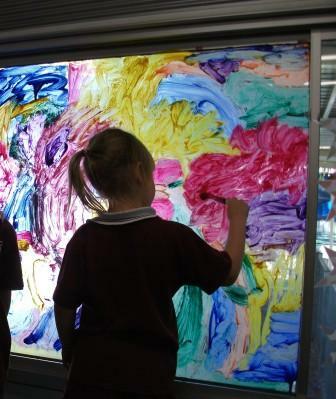 fact and I usually show a video about the subject as well on the Interactive Whiteboard. 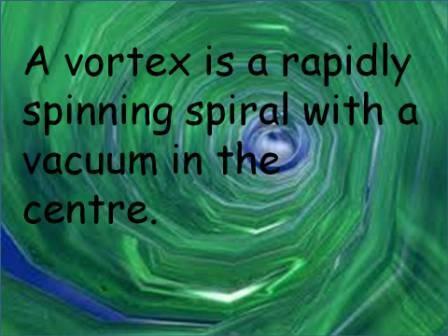 This weeks video was from SincScience#08 and is called The Beauty of the Vortex. 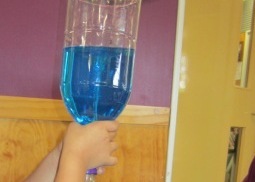 In the video the children are shown how a vortex is created using a spinning motion. 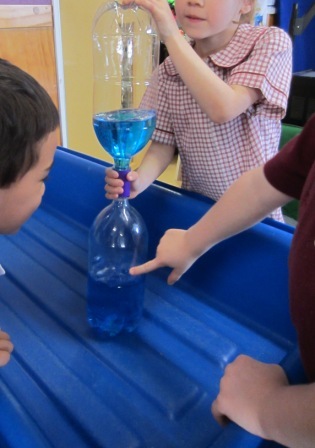 The children used their prior knowledge to relate this back to how water goes down a plug hole and when they heard the water gurgling began to use the Jolly Phonics action for the sound /g/, which is also a spinning action. They made comments such as “it’s like a tornedo” and “I can see a whirlpool”. They were fascinated by the images taken by a camera as it moved up and down inside the vortex and we discussed why there was no water on the camera lens even though it was in water. I love the way science engages children in thinking, problem solving and oral language and can be related back to their everyday lives. Here is the link to the YouTube video – http://youtu.be/GkbMJSeI25Q. 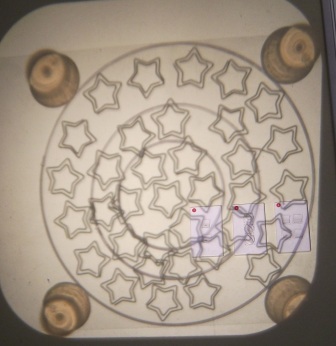 The video clearly shows how a votex is created by a spinning motion and we explored this further using our ribbons. 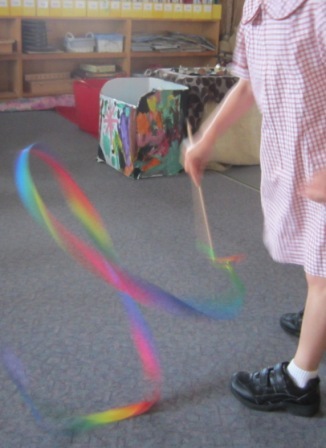 The children experimented with spinning and twirling the ribbons quickly and slowly and how the speed effects the spiral shape and effect. 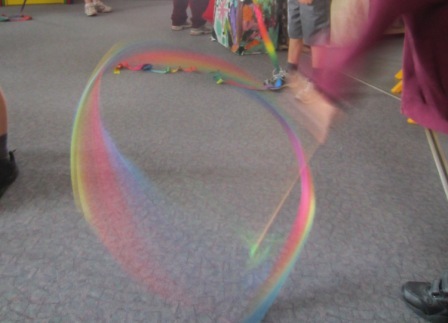 The rainbow pattern of the ribbons created similar images to the ones seen in the vortex video. 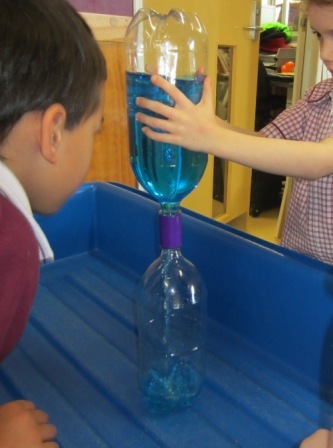 During Play Time several bottles of coloured water, joined at the neck with a connector, were available for the children to shake and spin to create a vortex inside a bottle. 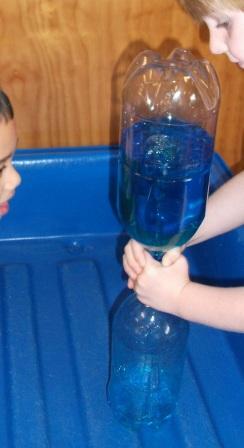 This activitiy was also a great opportunity to use their upper body and hand muscles as the children shook the bottles. They were very interested in the waterfall effect created in the lower bottle. 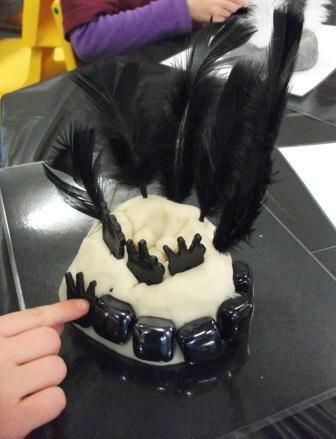 The children also tried looking down the inner part of the vortex just like in the video and even though this was unsuccessful, the conversations about why, were thought provoking and required lots of thinking and problem solving. 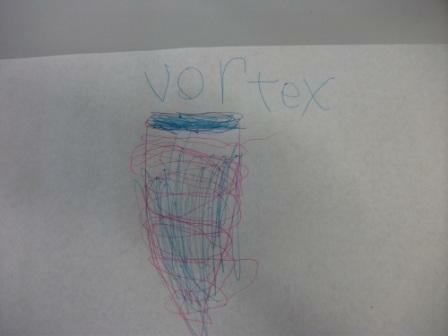 Some children recorded their observations of the vortex. 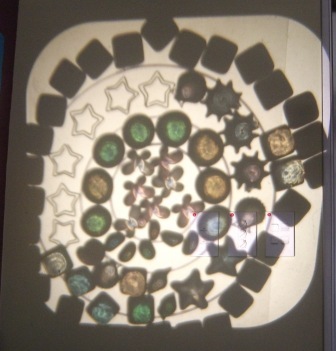 Their interest in spirals and concentric circles was further explored and exhanced as they created and used them in other areas of the classroom including the overhead projector. 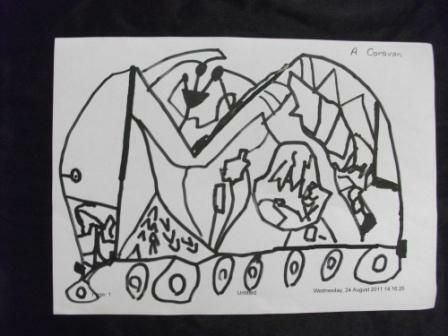 This drawing was also provoked through our exploration of the abstract work of Kandinsky, whose art was displayed and observed in the classroom and on the IWB. I’ll write about this in another post. 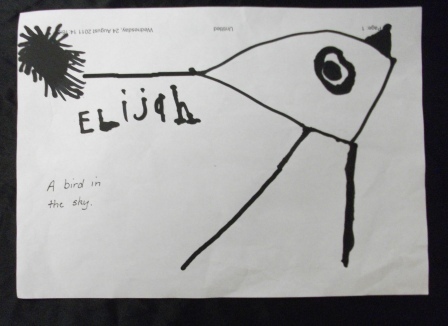 From phonics to……. 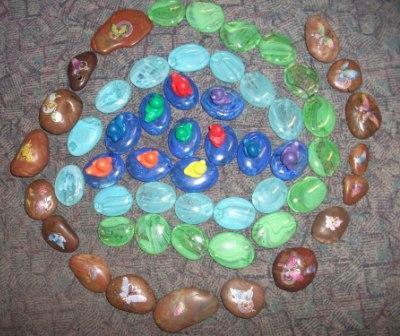 science to…….. loose parts to……. 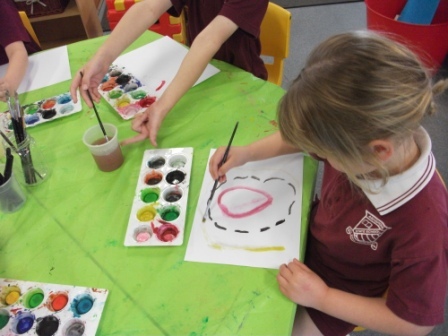 art……… it’s all part of the learning in a Prep classroom. 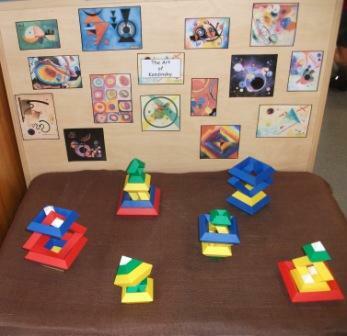 An invitation to explore and create. 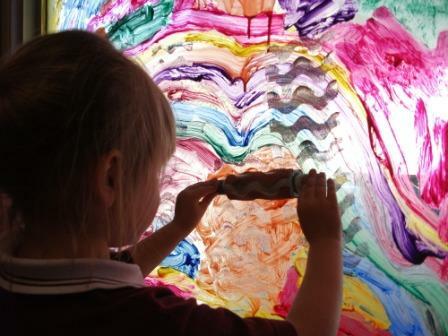 Over the last 6 weeks we have been interested in colour and light. Throughout our investigation and exploration we have read lots of books about colour but there have been 3 books that have really impacted on our learning and these are One and Zero by Kathryn Otoshi and My Many Colored Days by Dr Seuss. All 3 books explore the power of colour and we have had many conversations together about how our feelings can be represented using colour. We have compared the way the books have used the same colour to represent different feelings and discussed which feeling we individually thought the colour represented. Dr Suess’ book My Many Colored Days was the last of the 3 books we read. We found the contrast in illustrations between this book and the other 2 books interesting. 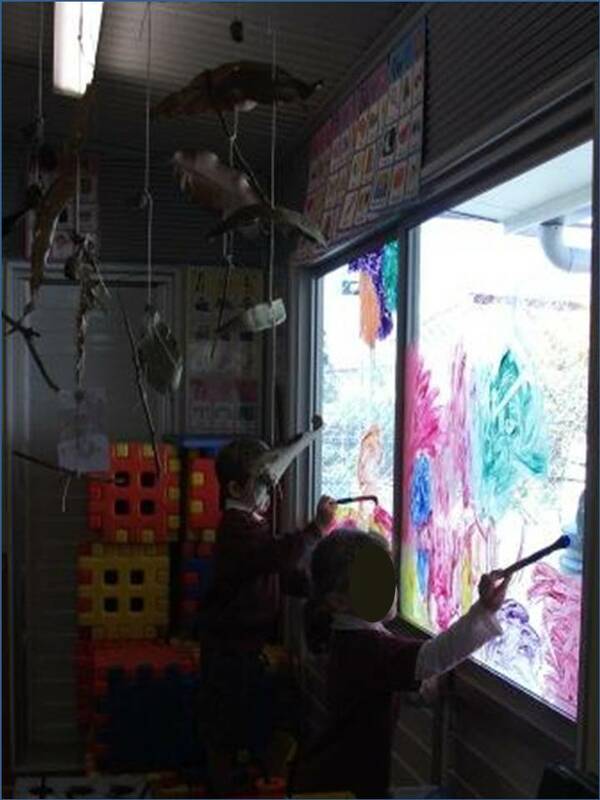 This contrast was a provocation for further exploration of colour and light and we decided to paint some of the windows of the classroom in observe the effect of the light shining in through the colours. 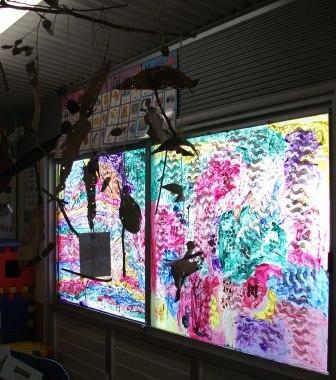 enjoying the effect of the light as it shone through. 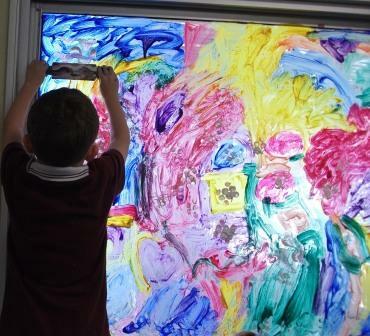 They discovered that the amount of paint they applied affected the lights ability to shine through……. 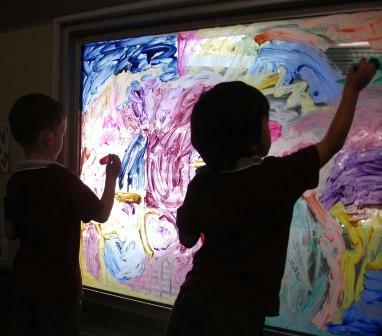 The children explored the effect of different brush strokes as well. 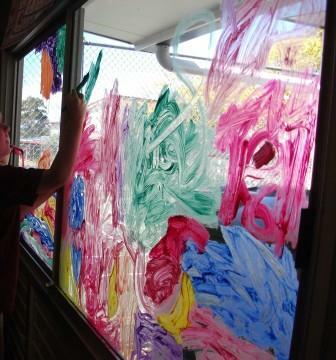 Slowly throughout these explorations and experimentations the windows were covered in paint. 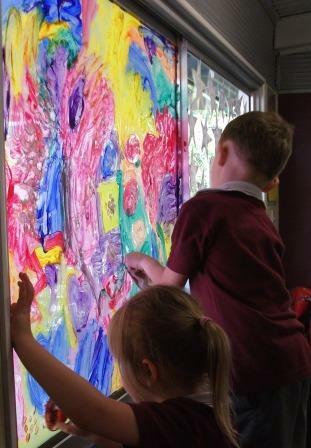 Then we added another layer of texture using our patterned rollers………. 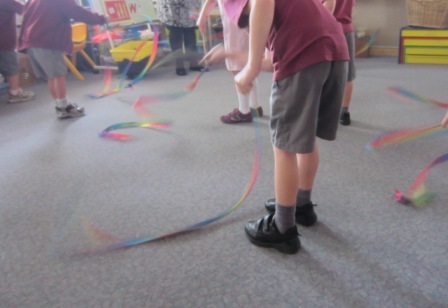 This experience was really good gross motor practice as well as we stretched up high and across especially when using the roller. We also used our dotted stamps to add to the effect. 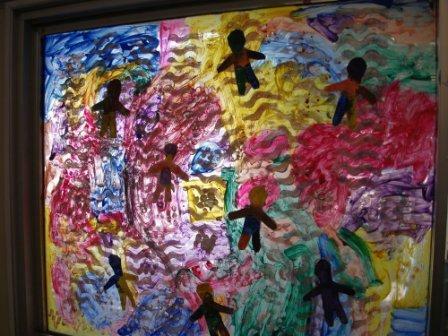 We rolled and printed all over the paint enjoying the added dimension and textures and then the painting of the windows was finished. 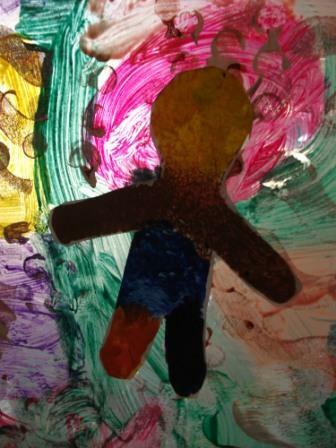 The next day we sponge painted body shaped stencils onto paper using colours that showed our feelings. 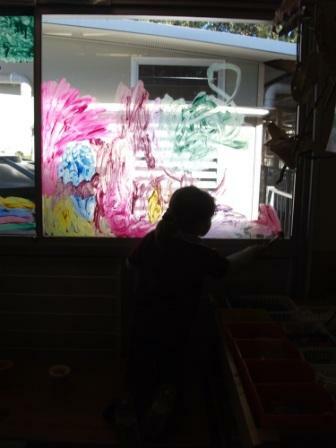 When these were dry we cut them out and added them to our coloured windows. 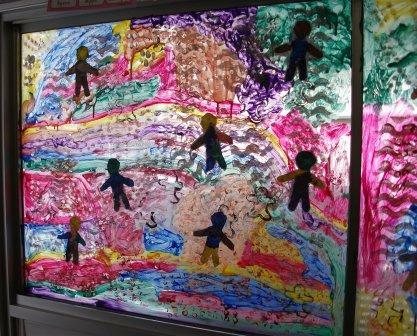 Our Many Coloured Day windows were finished. 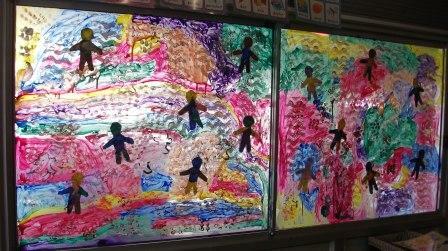 We love our windows and the way the light shines through them! We especially love the way our body shapes look like shadows. 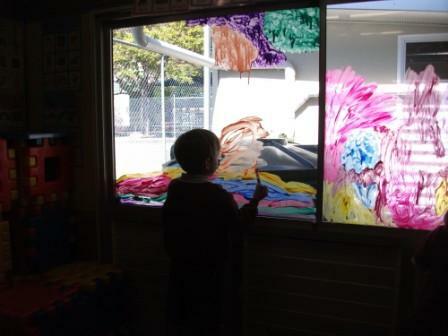 We loved this entire process and are now going to paint our other windows and the door at the front of the classroom. 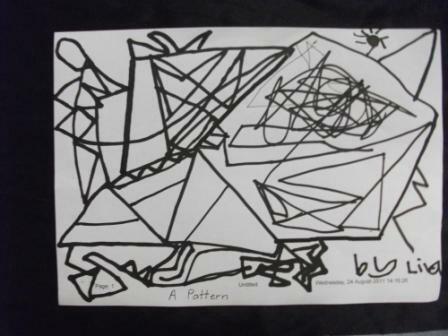 The children found the idea of creating drawings from squiggles an interesting concept particularly when, after drawing 1 idea, Mr. Squiggle would add some more lines to the drawing, his helper, (Miss Jane in this video) would turn the page around and suddenly the drawing was transformed into something new. 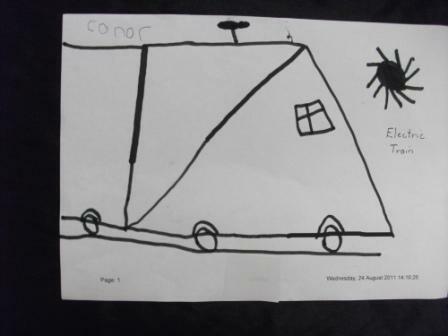 “Hmmmmm that’s clever” said one of the children. 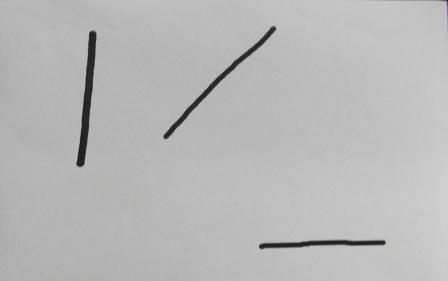 After watching the video again, I showed the children some squiggles on the IWB. 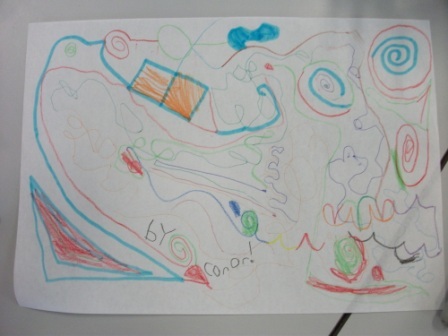 “I wonder what you could draw with these if you were Mr Squiggle?” I asked. 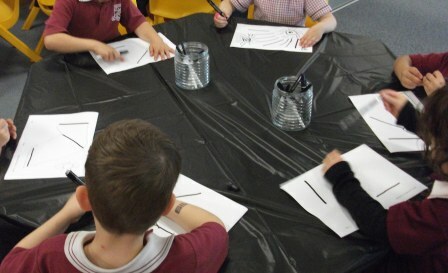 Many of the children began to share their ideas but before we got too involved in this discussion I said ” why don’t you pretend to be Mr Squiggle and show me instead.” We had some fun discussing how they were going to attach a pencil to their nose but in the end decided to use their hands to hold the pens and draw. 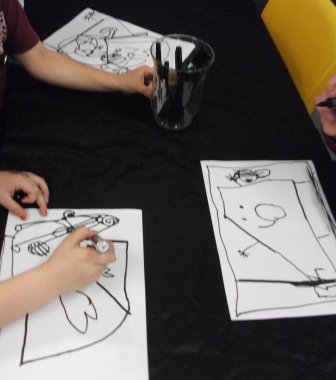 To enhance their exploration of the contrast between black and white, we had covered the tables with black tablecloths and placed black pens of varying thicknesses and inks in glass jars. 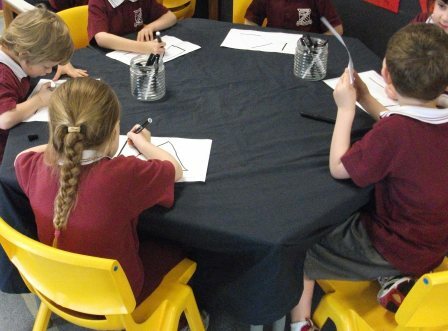 The white paper and black squiggles contrasted really well with the black on the tables and assisted the children to focus on, and explore their mark making. 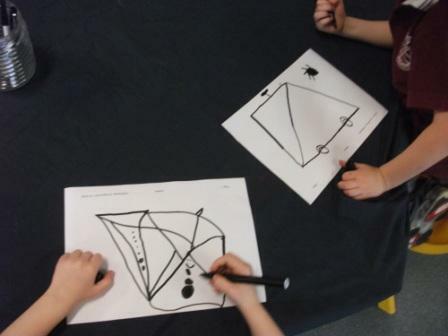 As they drew, there were lots of conversations about their ideas and it was interesting to listen to them share and narrate what they were doing, just like Mr Squiggle. 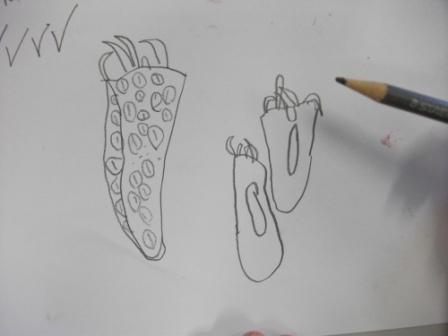 I was struck by how different the drawings are and wondered…… how the children could think of such interesting ideas? 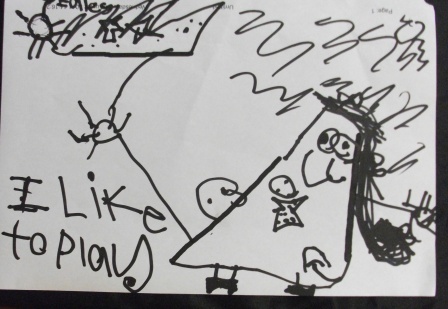 Here are some of their finished drawings. A bird in the sky. 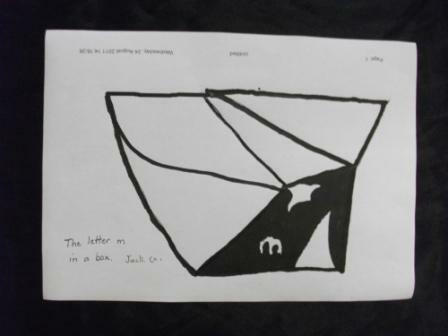 The letter M hiding in a box. 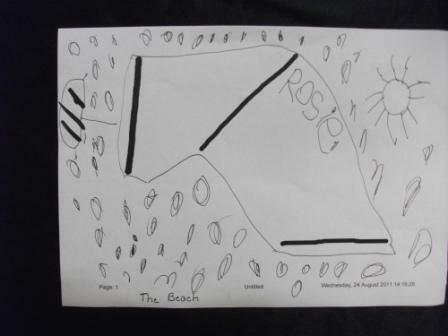 A towel on the sand at the beach. 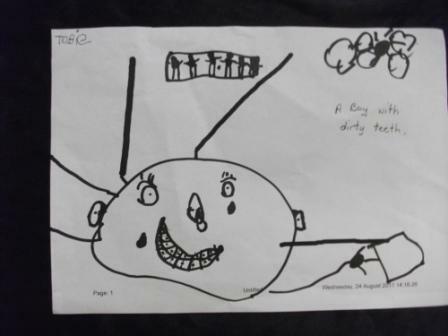 A boy with dirty teeth. 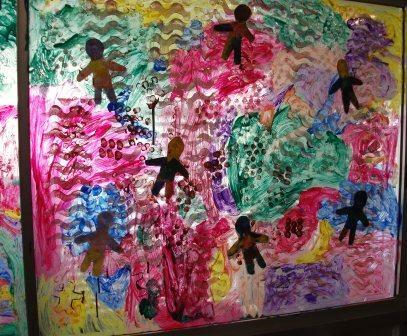 Young children’s imagination is truely awesome!